It's satisfying to dig one's own clay, process it until it's workable, then form and fire it using nothing but freely available materials. This is also a lot of work, and quickly teaches one the value of labor-saving tools, commercially prepared clay, and controllable kilns. 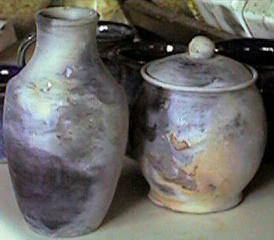 These two pots were fired overnight from December 31, 1999 to January 1, 2000 in our dining room fireplace. 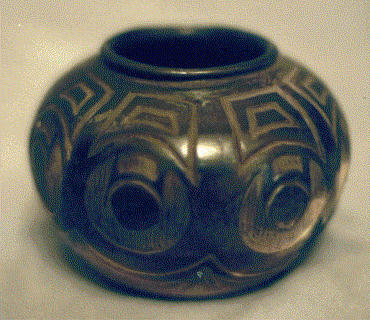 The clay is a raku body from the Appalachian Craft Center. The firing was begun slowly, with the pots wrapped in paper and buried in damp leaves. By midnight, the fire was blazing and the temperature was over 1750 °F, a healthy cone 05. The pots were then smothered with dry horse manure and ashes, and allowed to cool slowly. 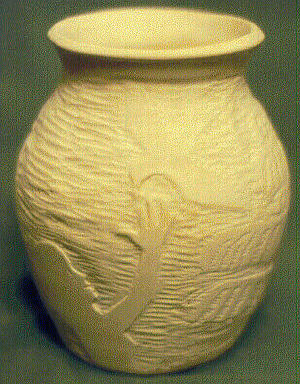 This wheelthrown, carved and burnished vase, made from the same clay, was electric fired to cone 04. It is unglazed. I call this clay Sunset, because it was dug from a trench next to Sunset Avenue (in Waukegan, Illinois).